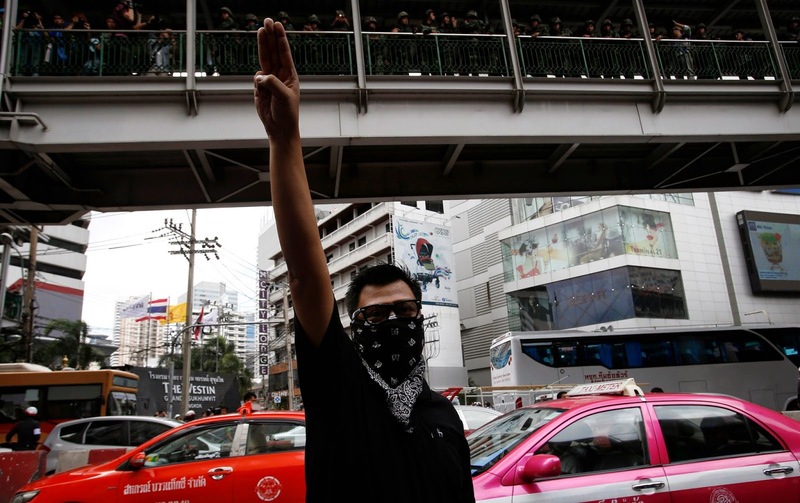 The symbolical three-finger salute from Suzanne Collins' The Hunger Games trilogy (and Lionsgate's The Hunger Games film franchise), which "means thanks, admiration and good-bye to someone you love," is being used as a real-life symbol of resistance in Bangkok, Thailand. 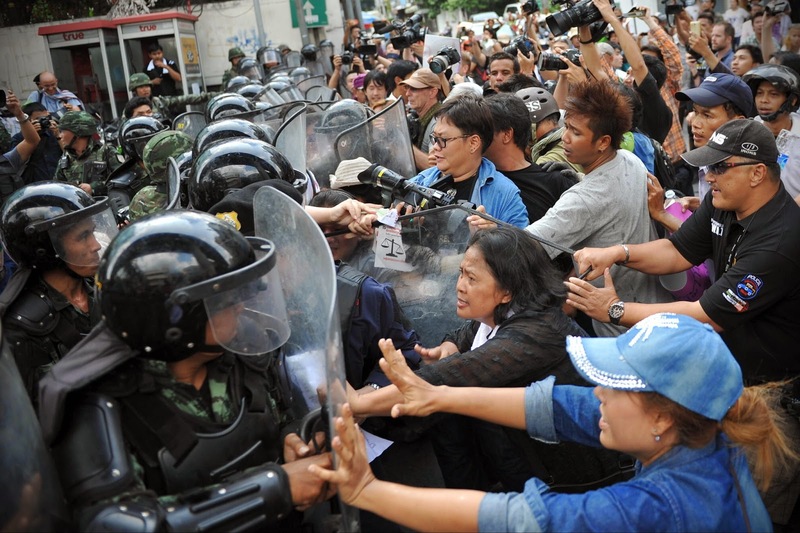 The Thai protesters against the military coup are using the gesture as a silent act of rebellion, and they are being threatened with arrest if warnings to stop continue to be ignored. Here's a more detailed report from THR. 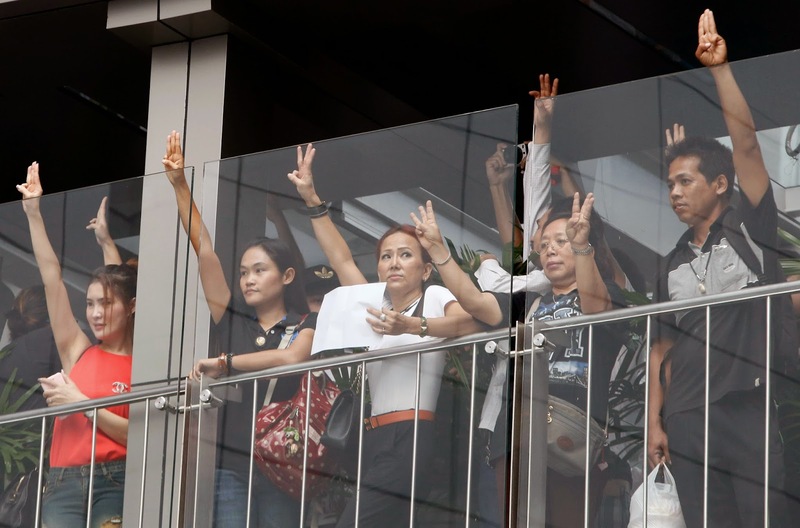 Flash mobs in Bangkok are deploying the film's three-fingered salute as an act of defiance, and the military junta says it will arrest those in large groups who ignore warnings to lower their arms. 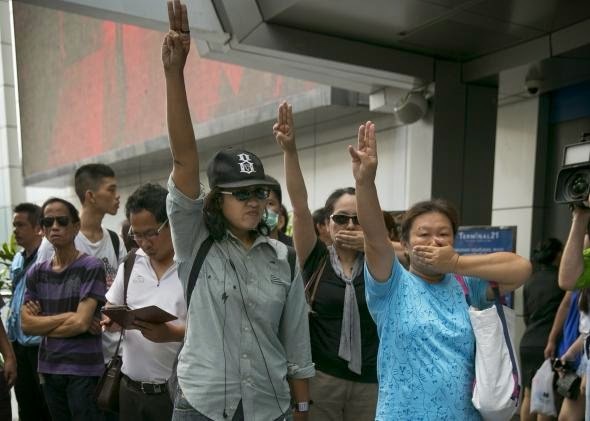 The Hunger Games' three-fingered salute is catching fire in Bangkok, where protesters have begun flashing the gesture as an act of defiant solidarity against the recent takeover of Thailand's civilian government by the military. Around 100 activists gathered flash mob-style at a large downtown mall in Bangkok Sunday, holding their arms aloft in the gesture and waving anti-coup signs at military personnel stationed nearby in armored trucks. 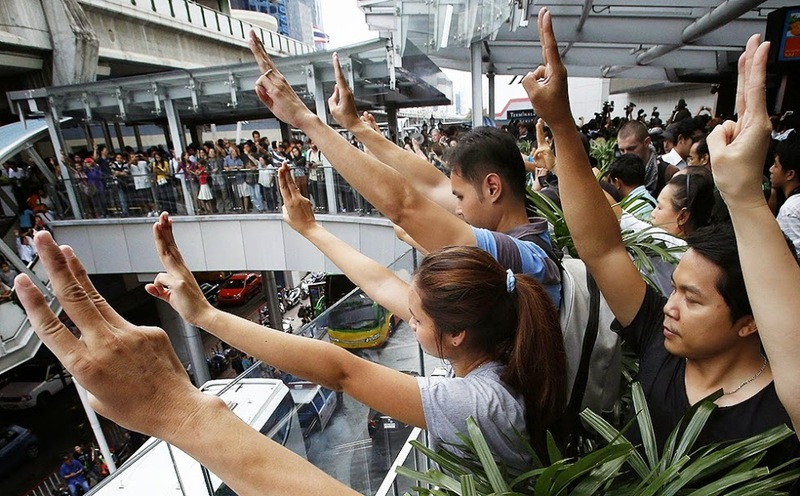 Thai protest groups writing on Facebook have said the gesture represents "freedom, equality, and brotherhood" -- the essential principles of democracy in Thailand -- while acknowledging that it is inspired by the fictional resistance movement led by Jennifer Lawrence as Katniss Everdeen in the global hit young-adult film The Hunger Games: Catching Fire. In the movie, set in a dystopian future, youths from a rural underclass are forced to engage in televised blood sport to entertain the elites in the capital city. The show is also meant to demonstrate the power of the imperial class' authoritarian rule. After taking power in a coup on May 22, Thailand's military instituted a nationwide curfew -- first set at 10 pm, later moved to midnight -- and banned public gatherings of more than five people. On Tuesday, the military lifted the curfew in key beach destinations in an effort to diminish the damage being done to the country's tourism industry. The ruling junta appears to be torn over how hard a line to take on those using the sign. "We know it comes from the movie, and let's say it represents resistance against the authorities," Col. Weerachon Sukhondhapatipak, a spokesman for the junta, told the Associated Press Tuesday. "If a single individual raises three fingers in the air, we are not going to arrest him or her," he said. "But if it is a political gathering of five people or more, then we will have to take some action. If it persists, then we will have to make an arrest." Twitter has been lit up with Thai protestors posting images of themselves on the streets deploying theHunger Games sign, some juxtaposed with images from the film. 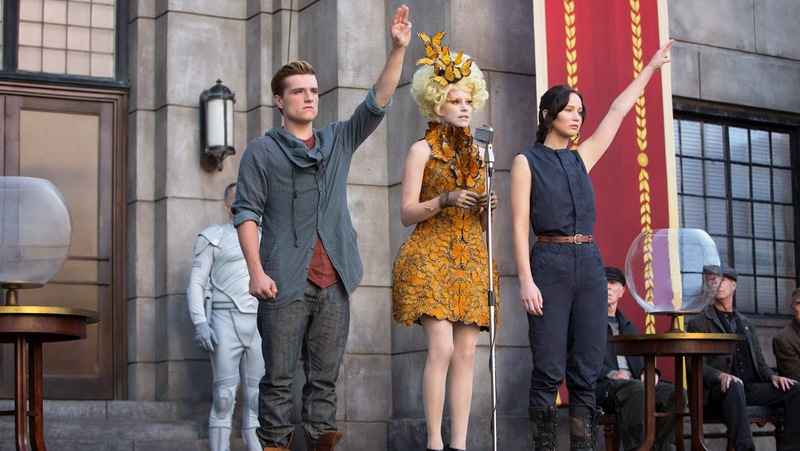 "Dear #HungerGames," tweeted one activist. "We've taken your sign as our own. Our struggle is non-fiction. Thanks." It's crazy to think how much The Hunger Games books and films have inspired the world. What do you think of this news, Hunger Games fans?